This Red, White & Blue No Bake Cheesecake has layers of blueberry, cheesecake, and cherries. This no-bake dessert is perfect for summer cookouts, picnics or any day you don’t want to heat up the oven. Who is ready for 4th of July? ** Raises hand, Me! Me! Me! ** Anyone else? I mean what is not to love? Cookouts, fireworks, ice cold beer, fireworks, parades and more fireworks and best of all cookout food! This year I decided to try something different with my no bake cheesecake and ended up very happy with the results. 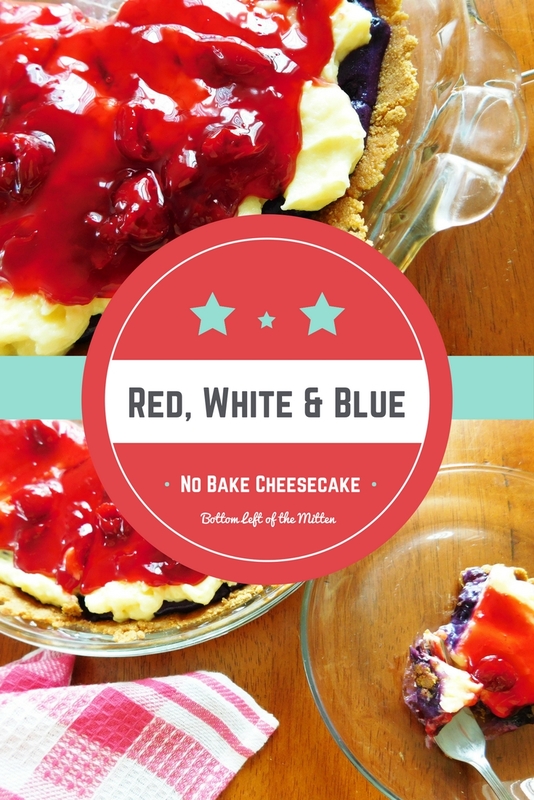 My Red, White & Blue No Bake Cheesecake will be making the cookout rounds this year. Every year for the 4th of July growing up we would have big parties at my grandparents house. Their home was on the main street of a small town and the parade went right by. Afterwards we would have a cookout. So much fun and so many great memories. This year we plan on spending most of the time by the pool at our new home. Kicking back and relaxing and spending time with the family is what it is all about, am I right? To get the ‘blue’ obviously I decided to use blueberries. Clean and wash 2 cups of them then add to a pot with sugar, water and cornstarch. 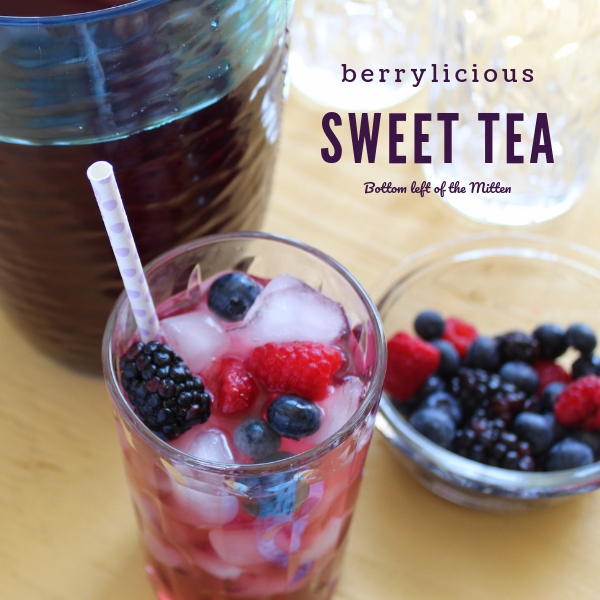 Bring to a boil over medium heat and let reduce and cook the berries down for 15 minutes. Remove from the heat and let cool completely. Prepare the crust using the graham cracker mix, sugar and melted butter. Put crust into a greased pie plate making sure to get the crust up onto the sides of the plate as well. Mix the cheesecake filling and milk together with an electric mixer for 2-4 minutes. 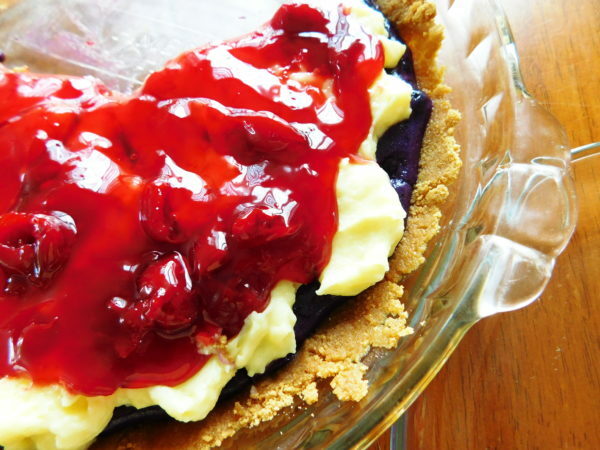 Take half of the cheesecake filling and mix with the cooled blueberry sauce. Place the blueberry layer on the crust. Add the rest of the filling on top of the blueberry layer. Now put the pie into the refrigerator for at least 2 hours. Before serving add the cherry topping after refrigerating. 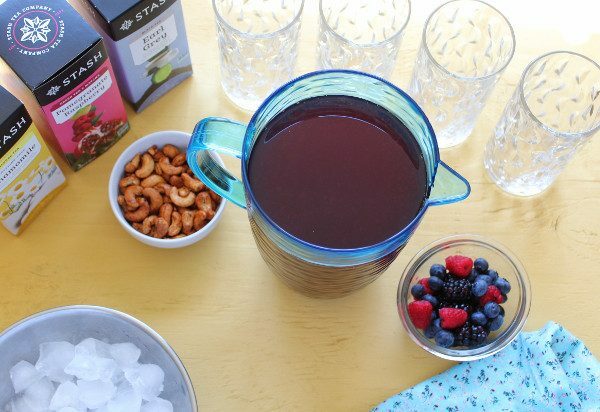 Blueberry Sauce adapted from Farm Girl Gabs. As always thank you to our Sunday Supper host! 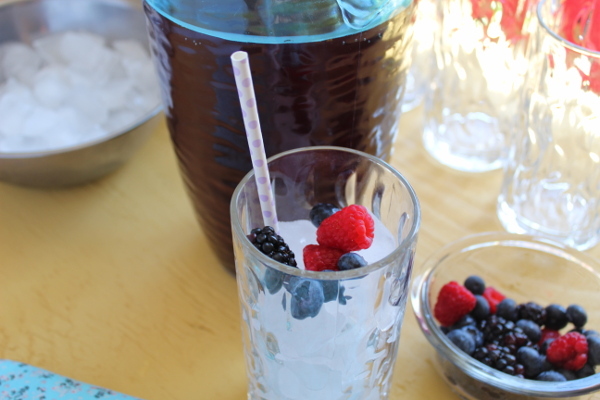 Check out these other recipes your 4th of July crowd will be sure to love. 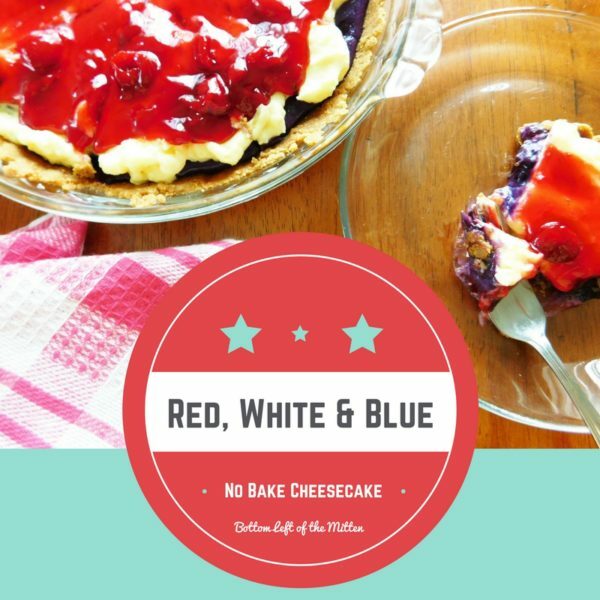 Red, White & Blue No Bake Cheesecake has layers of blueberry, strawberry, and cheesecake in a graham cracker crust. A perfect patriotic treat! Clean and wash 2 cups of them then add to a pot with sugar, water and cornstarch. 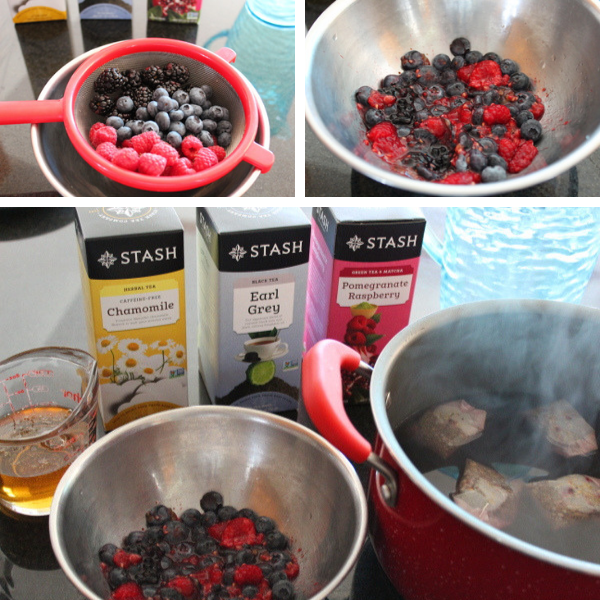 Bring to a boil over medium heat and let reduce and cook the berries down for 15 minutes. 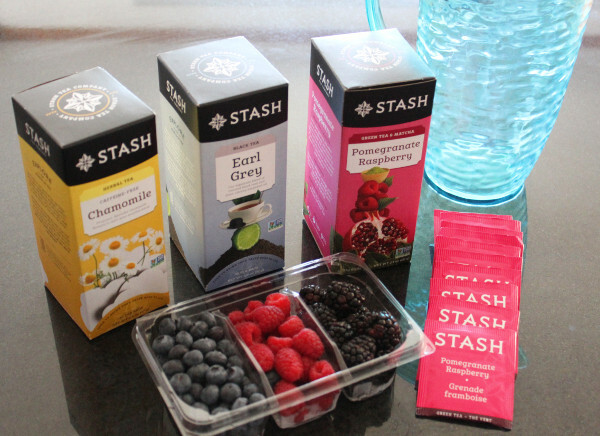 Remove from the heat and let cool completely. Prepare the crust using the graham cracker mix, sugar and melted butter. Put crust into a greased pie plate making sure to get the crust up onto the sides of the plate as well. 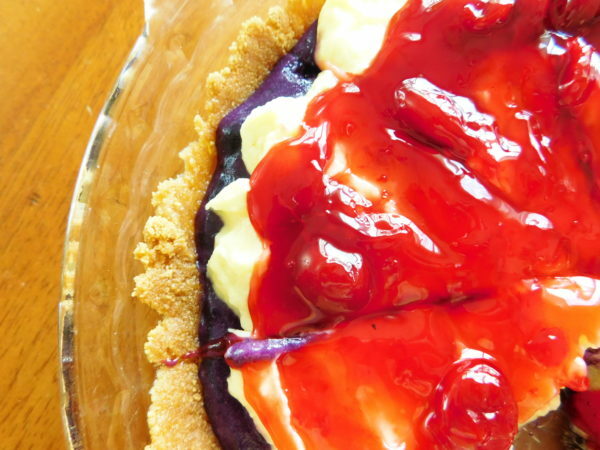 Take half of the cheesecake filling and mix with the cooled blueberry sauce. 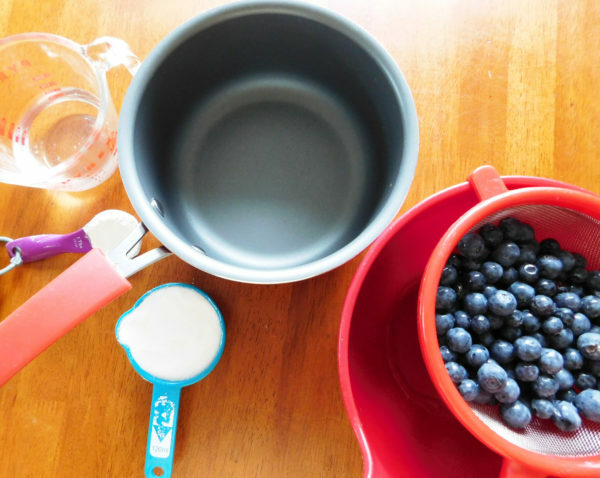 Place the blueberry layer on the crust. Now add the rest of the filling on top of that. 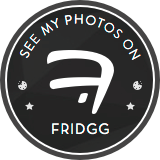 Put the pie into the refrigerator for at least 2 hours. Before serving add the cherry topping after refrigerating. Slice and serve. Enjoy!